Tako no Matsu, Nakanoshima, Osaka. This pine tree was located in front of a kurayashiki (蔵屋敷, warehouse) of the daimyo (lord) of Kurume (久留米), a town in Fukuoka Prefecture. Because the tree was shaped like a swimming octopus, it was called Tako no Matsu (Octopus Pine). The tree was considered one of the major sightseeing spots in Osaka. 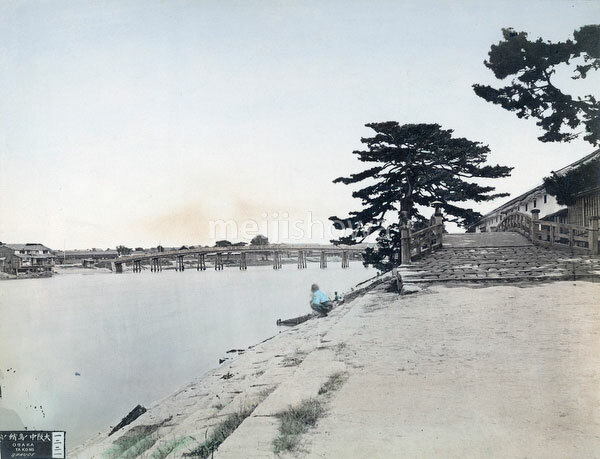 It was cut down in the second half of the Meiji Period (1868-1912). The bridge in the back is Taminobashi (田蓑橋), spanning the Dojimagawa River (堂島川). See blog entry.